Add Some Green to Your Routine Today! Superfoods to help boost your nutrition & achieve your ideal. 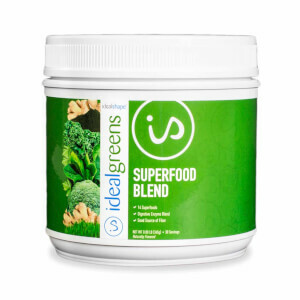 Give your body the nutrients it craves with the help of IdealGreens Superfood Blend! Hi I’m Trainer Kami! I’m a certified personal trainer, nutritionist, and yoga instructor and I’ve been helping people lose weight and achieve their ideal body for the last 10 years. As a trainer, and someone with their own weight loss story, one of the most important lessons I’ve learned is that weight loss isn’t just about slimming down and looking good, it’s about getting and feeling healthy. It’s important to fuel your body with the healthy, nutrient rich foods it craves for maximum weight loss potential. - A digestive enzyme blend. - Only 35 calories a serving. IdealGreens is the perfect way to supplement your nutrition and get more of the superfoods, nutrients, and antioxidants that your body deserves in a low-calorie powder. With only 1g of sugar and 3g of dietary fiber you’ll also be supporting your weight loss goals. - Help with weight loss. - Boost your immune system. - Minimize discomfort from bloating or gas. - Detox and alkalize the body. Supplementing your nutrition in order to look and feel amazing has never been easier or more simple. The average American doesn’t get nearly enough fruits and veggies, let alone superfoods! Superfoods are foods that are even more nutrient rich than other fruits and veggies. They’re the ones with the MOST antioxidants and nutrients. Let’s just say they’re a cut above your typical stalk of celery! You know you should be getting more of these superfoods, but with all the hype, confusion, and options out there, it’s tough to know which superfoods will give us the most bang for our buck. Not to mention that some of the most beneficial superfoods can be expensive, weird, and difficult to find. Often times only small specialty stores carry some of these high-end, super-healthy foods, forcing you to run around town just to check off your grocery list. And even after all of that, there’s no guarantee that you’ll end up eating the expensive, super-healthy foods you just invested in. A fridge full of leafy greens can go bad pretty quick. With your busy lifestyle, you don’t always have time to wash, prep, cook, and eat all the greens and superfoods you need. A green smoothie in the morning sounds great, but some mornings you barely have time to brush your teeth before running out the door. So chopping veggies to whip up a smoothie can be near impossible. That’s why I LOVE IdealGreens! It’s so convenient, you can just add it to your smoothie or mix with water. Really all you have to do is scoop and go. 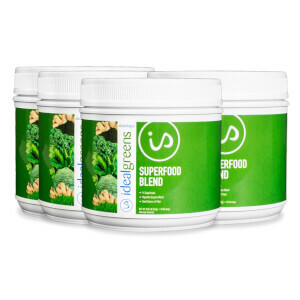 IdealGreens is the simple solution you need to supplement your diet. No running around trying to find the right foods, no wasting money when your groceries go bad, and no wasting time figuring out which foods are best for you and your goals. With IdealGreens you can live the vibrant, healthy life you want to live NOW. Greens are an excellent source of vitamins, minerals, and antioxidants. We made sure to pick greens that are considered “low-glycemic” to help you get the most benefits without piling on the calories and sugar. The antioxidants in greens are important for your health and weight because antioxidants help to reduce inflammation in the body. This inflammation can be damaging and cause pain, illness, fatigue, and weight gain. So by increasing your greens with IdealGreens you’ll feel amazing from the inside out, helping you to achieve your weight loss goals. - Spinach - May help with inflammatory diseases. - Kale - High in vitamin C, vitamin A, and Beta-carotene. - Wheat Grass - Helps balance fat in the body. - Beet Greens - High in vitamin C, vitamin A, and vitamin K.
- Chlorella - Helps decrease lipid absorption. - Spirulina -Helps improve glucose metabolism. - Broccoli - Rich in antioxidants, vitamin K, and B-complex group. Super greens weren’t the only superfoods we packed into IdealGreens. We’ve also included a number of other superfoods that are well known to provide a variety of health benefits that may indirectly help increase your weight loss! Many of the ingredients help you to reduce stress. Less stress equals less cortisol. Why does this matter? Cortisol is a hormone that your body releases in response to stress. The problem? Cortisol causes your body to hold onto fat, making it difficult to lose weight. And once again, many of these ingredients are also high in antioxidants, which boost our health by helping protect our cells from free-radicals that can cause a number of health issues, including inflammation. - Coconut Water - Very hydrating and high in antioxidants. - Dandelion Root Extract - Help with gastrointestinal ailments or inflammation. - Acerola Cherry - High in vitamin C and antioxidants. - Ashwagandha - Helps reduce stress levels. - Rhodiola - Offers generalized resistance to physical, chemical, and biological stressors. - Ginger Root Extract - Preventative qualities for hypertension. Fiber is an essential part to any healthy diet. Fiber has been linked to weight loss and healthy weight maintenance, heart health, and a reduced risk of diabetes. Many other greens supplements cut out the fiber from their formula, but we actually added healthy fiber back into ours in the form apple fiber. Apple fiber is a soluble fiber that will help you reach your fiber goals for the day. Most American’s don’t get enough fiber in their diets, but with IdealGreens you’ll get a little boost towards your fiber goal. Each scoop of IdealGreens gives you 3g of dietary fiber. This fiber will also contribute to you feeling fuller longer thanks to the fact that fiber takes longer to digest. Feeling fuller longer will help you say no to those pesky cravings allowing you to achieve your ideal shape. IdealGreens contains a potent blend of greens and superfoods to help you boost your nutrient and antioxidant intake and support your weight loss goals. Being healthy shouldn’t cost you an arm and a leg. IdealGreens helps you get the most bang for your buck. You won’t find another green superfood powder out there with the same quality for such a low price. IdealGreens contains less than 1g of sugar and absolutely no added sugars. With only 35 calories per scoop IdealGreens adds to your nutrition without throwing off your calorie goals. You want to take care of yourself the best you can. You want to live a happy, healthy, energetic life and finally reach your weight loss goals. But nourishing your body the way you should isn’t always easy. With a million and one obstacles blocking your path to a healthier you, we’ve got a solution that will clear the way: IdealGreens. 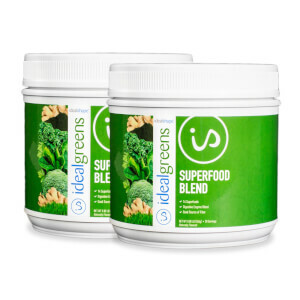 IdealGreens Superfood Blend will help you boost your daily nutrition by allowing you to take advantage of 14 superfoods, as well as our digestive enzyme blend, in a convenient powder. It’s so simple, all you have to do is add a scoop of IdealGreens to 8 oz of water or juice or mix it in with your smoothie. Try IdealGreens for yourself and start living the healthy life you’ve always wanted! * The % Daily Value tells how much a nutrient in a serving of food contributes to a daily diet and that 2,000 calories a day is used for general nutrition advice. What are the 14 Superfoods? Simply mix 1 scoop of IdealGreens with 8 oz of water or juice. IdealGreens also makes the perfect healthy smoothie mix-in. Try adding IdealGreens to your favorite smoothie recipe for a nutritious boost. In addition, improving your overall health can have a positive impact on your weight. For example, reducing inflammation and increasing energy make motivation and exercise easier which is crucial for achieving your weight loss goals.